Part III in a series that follows our renovation of a Chevy Chase, MD home. As foundation grading, drainage, and waterproofing continues progressing on the first-floor breakfast room addition, let’s take a minute and review the planned renovations to the second floor of this Chevy Chase, MD home. Most of today’s new homes incorporate the idea of an owner’s suite. The suite includes; a sleeping chamber appropriately sized for a large bed (queen or king), walk-in closet(s) with ample storage, and a private bathroom. We work in a lot of older homes that often lack the modern amenity of an owner’s suite. Such is the case at this Chevy Chase, MD residence. The bedroom is comfortably sized, but it lacked adequate closet space and shared a small hall bath with another second-floor bedroom. Not quite the private oasis the owners dreamed of. 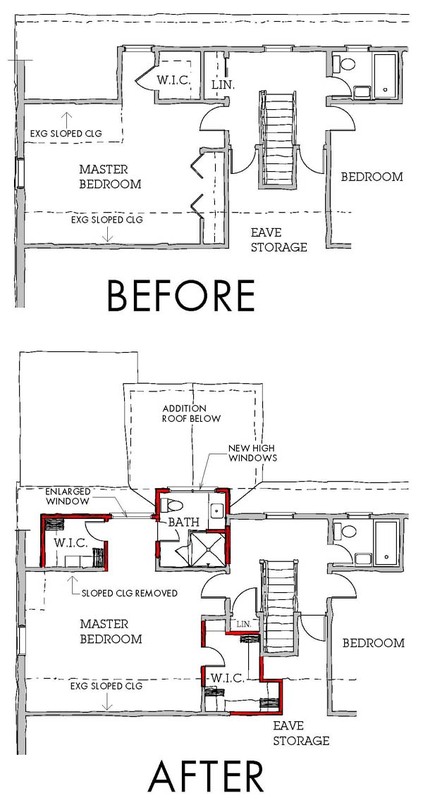 Our plan for the second floor expands an existing rear dormer to create additional space for a private bath and a new walk-in closet. Recapturing some under-utilized eave storage space makes room for a second walk-in closet. The result is a true owner’s suite that will be a calming space to retreat to at the end of a long day.